Mediterranean Tomatoes, Mozzarella and Basil Quick and Easy Salad. 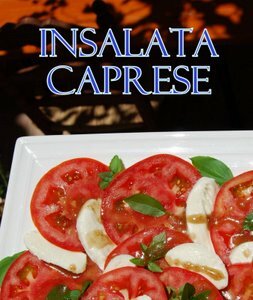 Caprese Salad Recipe originates from the beautiful sun-kissed Mediterranean Island of Capri, although, some areas of Italy, have claimed it as their own recipe in recent years. Just follow these step by step instructions and you will be amazed how easy it is to produce a stunning salad. We often have it for lunch...especially when we want something quick...we always have these typical Mediterranean Diet ingredients either in the fridge or garden. Traditionally a good quality olive oil and vinegar is used for dressing or you could use our own Vinaigrette Recipe, 4/5 tablespoons. Insert the sliced mozzarella between each slice of tomato. Garnish the whole salad with fresh basil leaves. Grind over some black pepper. Evenly spoon over the olive oil and vinegar or Vinaigrette Dressing. 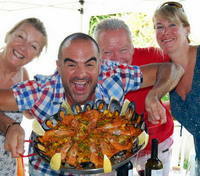 If you have time its a good idea to let the salad sit in the fridge for 20 minutes to really develope the juices and flavours. Serve with our Crusty Bread ......essential for mopping up those juices. 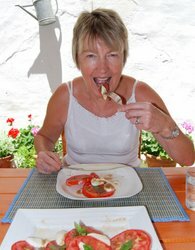 Pam enjoying our delicious Salad.